Clear. Pure. Beautiful. Nature has given ​​us a gift. We live so close to the heavens. The scent of wild herbs. The colours of the wildflowers. The lightheartedness of the animals. Something that you will only experience up here. Uniquely protected by our mountains. High up at an altitude of 1,060 m.
Mountain air is so good - Enjoy the magnificently fresh aroma of the mountains and farm. You will see a sea of ​​colour from various flowers. Step into your gumboots - kick off your holiday - out in nature - discover the farm and its animals. Our wooden farmhouse in the middle of beautiful peaceful nature invites you to stay. Our very own spring quenches your thirst and makes you want to discover our mountain farm. Feel the rhythm of our lives! You notice right away that we don't rush things, so you will have time to find yourself. 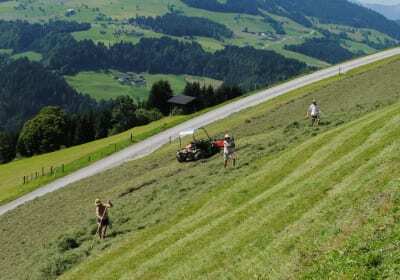 Our flower arrangements, which is traditional on Tyrolean farms, will delight you. ... where the sun shines the longest! 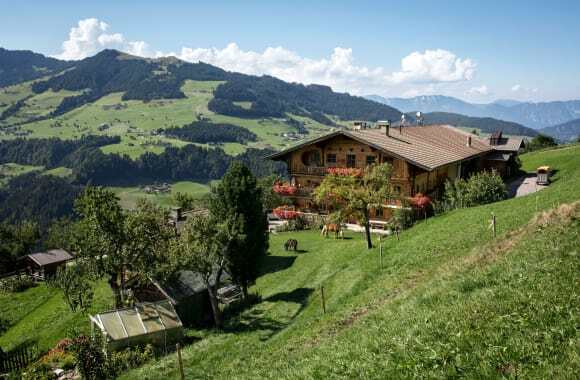 Take a break from it all and spend some carefree days in the Tyrolean mountains. 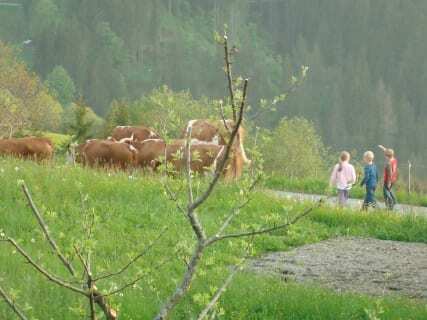 See our farm at 1000 metres above sea level, away from noise and dangerous streets. Nature provides a paradise for family holidays and the children have enough space to let off steam. Our farm offers 2 comfortable apartments for 2-5 persons. 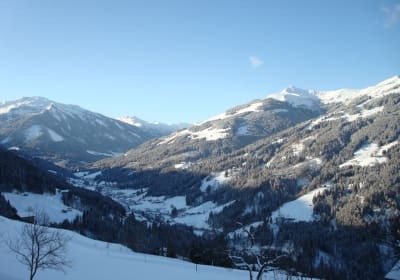 From the farm, you can reach Hopfgarten after about 6 km and access the largest single ski resort in Austria (Wilder Kaiser - Brixen Valley Ski World). Kelchsau is 3 km from our farm. 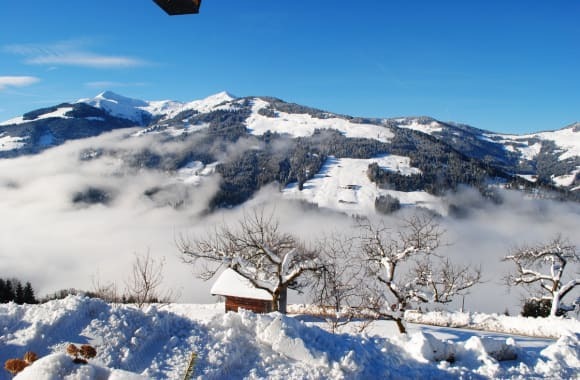 In Kelchsau there is 1 chair and 2 surface lifts, the best slopes and no waiting! Even for non-skiers Hopfgarten offers a many attractions such as sledding, ice skating, etc. We are at your disposal if you have any further questions. Take a walk in the clouds to gather great tasting fresh chives or parsley from the garden, or how about fresh milk from the cow or a freshly laid egg? If you still want more farm products, the farm shop in Hopfgarten is open every Friday. You will find something to your taste there. Our cosy, wood furnished holiday apartment (approx. 42 m²) has: 1 bedroom, 1 lounge/bedroom with a kitchen unit (4 hobs, oven, fridge, coffee percolator, kettle), shower/WC and a balcony. At your request we have baby equipment you can use. For example, a bath tub, baby-changing station, bottle warmer.